Obamacare Shakeout Hits Arizona, Southeast Hardest : Shots - Health News Competition on some exchanges will be diminished next year when three of the nation's largest health insurers drop out. Still, most marketplace consumers won't see any ill effects from the moves. Alina Nurieva (right) sat with Gabriela Cisneros, an insurance agent from Sunshine Life and Health Advisors, and picked an insurance plan at the Mall of the Americas in Miami last November. 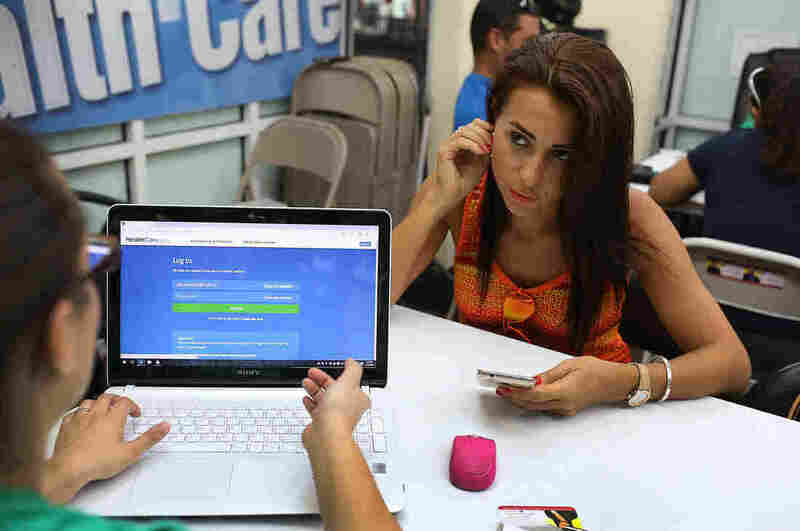 Some of the Affordable Care Act's insurance marketplaces are in turmoil as the fourth open enrollment season approaches this fall. What's ahead for consumers depends very much on where they live. Competition on some exchanges will be diminished next year when three of the nation's largest health insurers — Aetna, UnitedHealthcare and Humana — will sell individual plans in many fewer markets. The departure of several Blue Cross and Blue Shield plans in various states will also hurt. These pullbacks also come on top of the closure of 16 nonprofit co-ops, another coverage option, since January 2015. Aetna's exit announcement Monday that blamed financial losses on its marketplace plans gave Obamacare opponents who have from the start predicted the health law's failure a fresh chance to proclaim, "I told you so." That story line got more complicated Wednesday after the Huffington Post reported Aetna CEO Mark Bertolini sent a letter to the Justice Department on July 5 threatening to withdraw from the Obamacare marketplaces if the government sued to block his company's planned merger with Humana. The Justice Department did just that a couple weeks later. Still, most marketplace consumers won't see any ill effects from insurers' withdrawals, say the health law's advocates and independent analysts. "The effect on consumers is going to be mixed around the country," said Katherine Hempstead, a senior adviser at the Robert Wood Johnson Foundation. "Most of these marketplaces are not dependent on" the large national carriers. Also, the big insurers' announcements apply generally only to the individual market. The much larger market of employer-sponsored insurance is not part of the health law exchanges. Many major metropolitan areas, such as those in California, New York and Texas, will still have several insurers for individual health insurance consumers to choose from. In Texas, all major metro areas — including Austin, Dallas, Houston and San Antonio — will have at least three insurers after Aetna and UnitedHealthcare exit. That's true also for most urban exchange customers living in the Northwest, the Midwest and New England. Remaining insurers might raise their monthly premiums as a result, but more than 8 in 10 consumers on the marketplaces who get government subsidies would be insulated. Subsidies increase as premiums rise. One concern is that with less competition, insurers may tighten their provider networks and give these consumers fewer choices of hospitals and doctors. That trend started several years ago, and some states have responded with regulations requiring insurers to provide customers with reasonable access to doctors and hospitals in each county where they sell plans. Nearly 13 million people signed up for Obamacare marketplace policies for 2016. Aetna, UnitedHealthcare and Humana have 2 million members in total, but their exit from certain states is predicted to affect between 1 million and 1.5 million people who will have to choose new carriers. While changing plans can force people to find new doctors, it's also the best way for consumers get the best deals on coverage. Aetna will exit 11 of 15 states where it sells plans on the exchanges. UnitedHealthcare has said it will quit 22 of 34 states, and Humana will leave four of the 15 states where it operates. "We could be looking at about 1 in 4 counties in the U.S. with just one exchange insurer next year, though this could change between now and open enrollment in November," said Cynthia Cox, associate director for the Kaiser Family Foundation Program for the Study of Health Reform and Private Insurance. Overshadowed by the big insurers' withdrawals is the prospect that other carriers will enter markets the three giants are leaving. Smaller insurers Molina and Centene have said they're doing fine on the exchanges. And Cigna, a larger insurer, has said it will move into some North Carolina counties for 2017. North Carolina will be left with just one or two plans in most of the state after it loses UnitedHealthcare and Aetna plans. Health insurance analysts say three insurers are needed for a healthy competitive market. "We've had a very robust enrollment under the ACA and hope consumers will still see benefits of having coverage even if they have fewer options," said Ciara Zachary, health policy analyst for the North Carolina Justice Center's Health Access Coalition. Rural Americans had few health insurers to choose from even before Obamacare, but some suburban and urban parts of the Southeast will be in the same fix next year. In southeast Florida, consumers in counties near Naples and Fort Myers will have only one marketplace insurer — Florida Blue — next year, unless other insurers step in. "There are some headwinds, but it's not a question of whether the market will stabilize but how quickly and how well," said Hempstead. Strong winds are already blowing with hurricane force toward Arizona's Pinal County, southeast of Phoenix, health care advocates say. Nearly 10,000 people enrolled in Obamacare marketplace policies this year and about 85 percent received a federal subsidy. In 2017, Pinal stands to lose its only two insurers — UnitedHealthcare and Blue Cross and Blue Shield of Arizona. "Clearly this is a big concern for consumers," said Allen Gjersvig, director of navigator and enrollment services for the Arizona Alliance for Community Health Centers. He said he is hopeful another insurer will step in, but not confident. Neighboring Maricopa County, which includes Phoenix, is expected to have just two relatively small insurers in the area left on its marketplace next year. Gjersvig questions whether those two — Cigna and Phoenix Health Plan — will have enough doctors and hospitals under contract to handle their new members after larger rival Blue Cross and Blue Shield of Arizona gives up its 40,000 customers. At least a dozen other counties in Arizona will be left with just one health insurer, he said. Arizona had eight insurers operating in various parts of the state this year, but four are leaving entirely — Aetna, UnitedHealthcare, Humana and Health Choice. Two more, Blue Cross Blue Shield and Health Net, are scaling back their participation. Despite the problems with the marketplaces, Gjersvig said thousands of people have gained coverage through them and he is confident they will survive. "We do not see this as a death knell for the marketplace," he said. Tammie King, an insurance agent in Columbia, S.C., is less sure how insurer departures will affect consumers in the Palmetto State. The pullouts by UnitedHealthcare and Aetna mean there will be only one carrier in the state in 2017 — Blue Cross and Blue Shield of South Carolina. That's a particular concern in Columbia, she said, because the Blue Cross plan does not include one of the biggest hospitals, Lexington Medical Center, and its affiliated physicians. "People will be left unable to see the doctors they are now using," King said. King said she worried the Blue Cross plan will use its monopoly power to further reduce the number of doctors and hospitals in its network and limit its choice of prescription drugs. "You can't blame them because ... they have to do something to control costs," she said. Kaiser Health News is an editorially independent news service supported by the nonpartisan Kaiser Family Foundation.You can follow Phil Galewitz on Twitter: @PhilGalewitz. The original version of this story said open enrollment for health insurance on the exchanges begins Nov. 15., but it starts Nov. 1.